Sergey Lavrov has lashed out at the US for their double standards over Ukraine and taking steps that “only promoted further aggravation” of the conflict. He added Russia is ready to guarantee agreements between Kiev and the self-proclaimed republics. One of the major sticking points of the crisis so far has been the failure of Kiev to engage in talks with militia leaders in the East of the country. Lavrov is staggered the US, who talked with the Taliban during their invasion of Afghanistan, through channels in Doha, Qatar, is unable to put pressure on Kiev to engage in discussions. “In the case of Libya, Afghanistan, Iraq, Yemen and Sudan our partners actively asked governments to enter into dialogue with the opposition, even if they were extremists. However, during the Ukrainian crisis, they act differently, making up excuses and try to justify the use of cluster bombs,” the Russian Foreign Minister said, who was speaking at a security conference in Munich on Saturday. The issue of the far right’s rise in Ukrainian politics has been swept under the carpet by the US and EU. Some members of the Ukrainian parliament have promoted ideas such as exterminating Russians and Jews. However, these haven’t been reported or caused any alarm in the West, Russia’s foreign minister added. Throughout the Ukrainian crisis, the West has viewed Russia as the aggressor. The Kremlin has been accused of arming eastern Ukrainian militia and even sending Russian troops to reinforce them - claims Moscow has repeatedly denied. It has stated on many occasions that despite the damning rhetoric no sufficient evidence has been ever presented. On the contrary, Lavrov says the US has been the destabilizing factor in Ukraine. “Through every step, as the crisis has developed, our American colleagues and the EU under their influence have tried to escalate the situation,” Lavrov maintained. He pointed to the failure of the EU to engage Russia about Ukraine signing an economic association agreement with the bloc, Western involvement during the Maidan protests, the failure of the West to condemn Ukraine for calling its own citizens terrorists and for supporting a coup, which led to the toppling of a democratically elected president. “The US made it public it brokered the transit of power in Ukraine. But we know perfectly well what exactly happened, who discussed candidates for the future Ukrainian government on the phone, who was at Maidan, and what is going on (in Ukraine) right now,” Lavrov said. Despite these setbacks, Russia’s foreign minister says his country still wants and needs a normal relationship with the West. There is some hope that a solution to the conflict may emerge, following German Chancellor Angela Merkel and French President Francois Hollande’s visit to Moscow for talks with Vladimir Putin. Announcements from Washington and NATO that they might provide Kiev with weaponry, which has long been sought by Ukrainian President Petro Poroshenko, are thought to have galvanized parts of Europe to try at last to find a peaceful solution to the conflict. 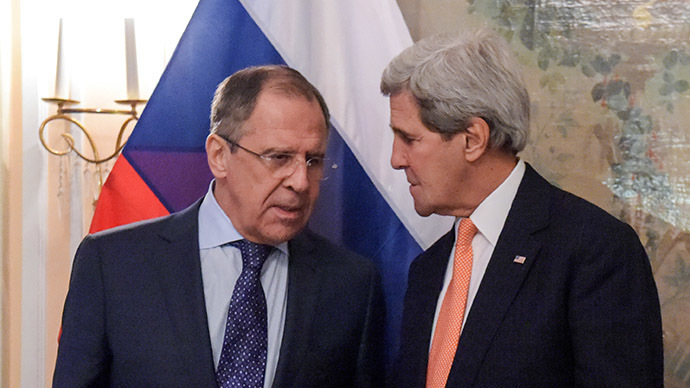 Lavrov is adamant that a military solution is not the answer and would only inflame an already volatile situation. He added that Russia, Germany and France are ready to become guarantors of the agreements, if that can be achieved between the protagonists in the Ukraine crisis. “If the main participants of the Minsk peace process, the Ukrainian authorities and the representatives of the Donetsk and Lugansk People’s Republics, come to an understanding on every article of the Minsk agreements, I’m absolutely sure that Russia will be there to secure the guarantees of these agreements,” he said. Lavrov spoke at length and on numerous occasions about the need for all countries to adhere to the Helsinki accords, which among other things, champions the self-determination of peoples and respect for human rights. He mentioned that European security is based on both the UN Charter and the Helsinki agreement, but has been sabotaged by the US and its allies. While the West has hit out at what it believes to be a Russian ‘annexation’ of Crimea, the Russian Foreign Minister says that the will of over 90 percent of the peninsula’s population has been ignored, pointing to a referendum in which residents almost unanimously voted to join Russia. He gave the example of Kosovo, which despite not holding a referendum, was allowed to leave Serbia and create its own state. Sergey Lavrov was also critical of the US for breaking the Intermediate-Range Nuclear Forces Treaty (INF), which had been signed between the two countries, saying the global community was fully aware of Washington’s actions. “During the creation of the global anti-missile shield, Washington expanded a large scale program that was designed to create target missiles, which were similar to those banned in the INF treaty, such as ground based ballistic missiles,” Russia’s foreign minister concluded. He stressed during their meeting in Munich that Russia and the US agree that the only basis for any solution is comprehensive national dialogue on constitutional reform. Lavrov added that Russia will not sacrifice its “national interest,” but is ready to “engage constructively” with the US, according to the foreign ministry’s Facebook page. He also said that trying to pressure Russia with sanctions is useless and will not solve the crisis.